After clicking on ‘Shut Down’ it still takes an eternity until the computer turns off . Apart from hanging programs and services, sub-optimal system settings also cause delays. If the shutdown process lasts for more than a short period, you might have switched on an options that deletes the Windows paging file at each shutdown. On one hand this increases your security because the entire contents of the paging file will be overwritten when you shut down—it contains passwords and sensitive data that can no longer be detected. On the other hand, it usually costs a lot of unnecessary time for to delete the several gigabytes, which is not necessary on a home PC. The best option is to turn off the function again. 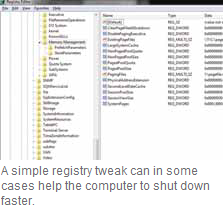 You will need to enter the Windows registry. Just type’ regedit’ in the search box in the Start menu and press [Enter]. Confirm the User Account control question with ‘Yes’. Navigate to the key ‘HKEY_LOCAL_MACHINE\System\CurrentControlSet\Control\SessionManager\Memory Management’. In the right pane, open the DWORD Value ‘ClearPageFileAtShutdown’, double-click and change its ‘Value’ to ’0’. Then confirm with OK. Close the window. In the future, the shutdown process should again be significantly faster. NOTE: If you use a Solid State Disk as a system hard drive, you should definitely deactivate this safety function, because it will significantly shorten an SSD’s lifespan.